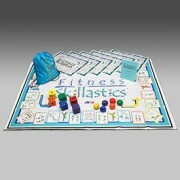 The mat highlights all four fitness components – aerobic endurance, muscle strength, muscle endurance, and flexibility. It will also help students achieve a higher level of fitness in a unique and non-competitive environment. The activity mat can be used in a gym, outdoor space, or large open classroom.